If there is one thing that has we’ve learned over the years, it’s that being a contrarian pays off. Much has changed on Wall Street, but the philosophy – some would say discipline – of zigging when others are zagging has remained a core feature of finance since the days traders gathered underneath the buttonwood tree on Wall & Broad. After coming through a very rocky start to 2016, nearly all market observers thought May – of “sell in May and go away” fame – would be a difficult month for the stock market and usher in the most painful summer since the financial crisis. And it may yet be the case, as predicted by most, if not all, of the research coming out of the big banks. Yet when the whole Street thinks the market will go one way, it tends to go the other; U.S. equities were the best-performing asset class during the month, oil prices rallied, and U.S. Treasuries rose in May despite a Fed heaven-bent on raising rates. Go figure. While the level of bearishness has dissipated somewhat, there remains a core skepticism that stocks can actually grind higher from here. Everything from earnings to a slow-but-steady devaluation in the Chinese yuan and a looming Fed rate hike is cited as reasons why stocks couldn’t possibly rise from here. However, we also learned long ago that sometimes, things in finance are not as complicated as they seem. Want to know why the market is going up? The simple reason goes back to elementary risk and return. 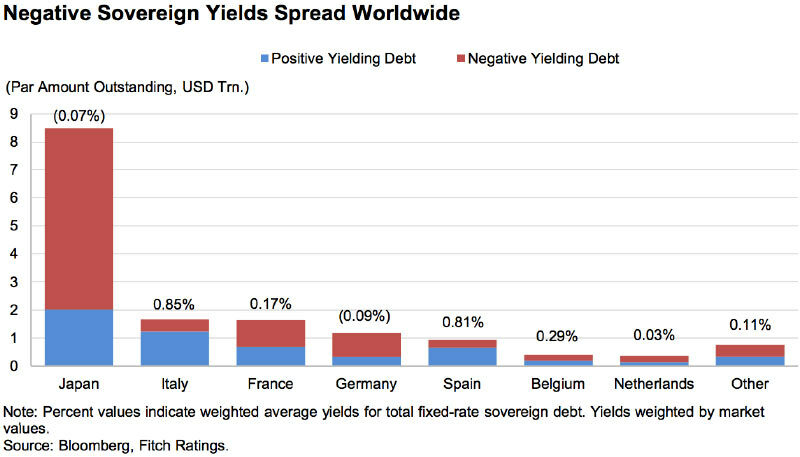 In January, the total amount of sovereign debt with negative yields was $5.5 trillion – a staggering sum, to be sure. By February, this total had reached approximately $7 trillion. And by April 30, $9.9 trillion. By the start of June, the total amount of negative-yield government debt in the world crested an extraordinary $10.4 trillion from 14 countries, with Japan and the Eurozone by far the largest issuers. How we got here is relatively complicated – a caustic mix of hyper-aggressive post-crisis monetary policies, well-intentioned but poorly considered regulatory changes, risk aversion by global financial institutions, and a general flight to safety by a generation of investors still scarred by what happened in 2009. But $10.4 trillion…that’s some serious cash, and it nearly doubled in six months. Think about it for a moment. At the height of the housing bubble, subprime mortgages – the toxic debt that bankrupted several global financial institutions and very nearly spiraled the entire world economy into oblivion, was a mere $1.3 trillion. In other words, the total amount of sovereign debt with negative yields iseight times that of the subprime bubble. Describing traded credit markets as overbought somehow doesn’t quite do it justice. Like we said, it doesn’t take an army of analysts to figure out why U.S. stocks and bonds are getting persistent bids. There are no alternatives, regardless of what one might think of valuations, earnings, political elections, currency movements, interest rate hikes, QE, etc. Hate the market and want to go to cash? Depending on your currency, that will cost you. Want to flee to the “safety” of government bonds? Same thing. Remember the old saying that capital flows to where it is best treated – and a negative bond yield, which guarantees a loss of principal to the owner if held to maturity, is one of the purest mistreatments of capital we’ve ever seen. Nothing trumps the fact that negative yields are pushing money out of those instruments and into something – anything – that might generate a positive return. The current surge of interest in private debt, Old Hill’s corner of the market, is closely related to this development because the asset class offers yield in a world where there is little to none. Risk, which used to be the only thing a fixed-income manager really cared about, is now wholly secondary to return. For what it is worth, this “experiment” with negative yields – and make no mistake, that’s what it is – is uncharted waters for the global financial system. We’ve never been here before, and regardless of what central bankers say in their speeches, no one really knows how to wean that system off the incredible liquidity crutch that has developed as a consequence of post-crisis policies. It all reminds us of the bubble in tech stocks back in the late 1990s – we didn’t know when precisely that would end, but we had a pretty good feeling how it would end. So if you’re wondering why the stock market is inching its way northwards despite a bevy of reasons it really should be heading the other way, remember that 1) it probably won’t go significantly south as long as the entire investing world thinks it will, and 2) there is far too much capital fleeing negative interest rates for it to really go anywhere else. Sometimes the simplest explanation is the best one, even on Wall Street. How long will it last? Good question, and not one we or anyone else can answer. But going forward, note that there has been five occasions when the Fed hiked rates once, paused for one or two quarters, and then resumed tightening. In these instances, which all else being equal appears fairly similar to current circumstances, bonds outperformed equities, which were down over the next three and six months. Even should the fed hike in July or September, the historical record suggests the pervasive underlying bid in traded credit will remain regardless what stocks do, in turn keeping yields depressed and the relative attractiveness of private debt strategies such as those pursued by Old Hill Partners very high. Each month, we like to include an example of a transaction Old Hill is either considering or has rejected as a way of illustrating our overall approach. Each month, we like to include an example of a transaction Old Hill is either considering or has rejected as a way of illustrating our overall approach. This time, we’d like to highlight a proposed deal with a merchant cash advance provider. Merchant cash providers focus on providing financing up to small and medium sized businesses that need financing for business expansion, inventory augmentation, or equipment purchase. The short-term small-balance business loan market is estimated to be around $200 billion annually, which leaves plenty of room for growth, while short-term loans allow both bankable and underbanked businesses to borrow quickly with minimal paperwork. In addition, significant improvements in credit modeling, fraud detection, and the provision of real time credit data, have made determination of credit risk much more accurate, quicker, and less cumbersome. The company utilizes significant proprietary marketing assets, search engine optimization infrastructure, to effectively attract business owners interested in cash advances at very low acquisition costs. Using a rigorous automated data infrastructure, the system analyzes numerous factors including behavioral patterns, advertising source and query intent. Their marketing system has led to strong growth at very low costs; originations have grown at a monthly compounded rate of more than 20%. Leads are then sold to an established small-balance marketplace lender for underwriting and servicing. The company participates in these loans and uses its experience in small business lending (more than 1,500 loans to date) to effectively monitor underwriting standards. Their experience has resulted in significant intelligence about what factors correlate well with a successful borrower in this niche, and which ones tend to predict problems down the road. This information has become a competitive advantage for the company and guides its credit risk management. Loans are made only to the highest-quality merchants who exhibit those attributes that consistently correlate well with performance. In addition, risk is further mitigated by the short duration of the loans and fixed daily ACH repayments from a borrower’s bank account. Such process discipline leads to higher returns, fewer defaults, greater recoveries and an ability to influence repayment behavior. Due to low customer acquisitions costs, strong origination volume, and above average loan performance, Old Hill has proposed a senior secured revolving credit facility of approximately $15 million to help the company grow. Wholesale lending, or the provision of growth capital to other credit-related companies that then originate loans, is an area we know well. We have executed a significant number of similar deals in the past, with good results, and like the risk-sensitive approach taken by this company’s management team. There is never any shortage of lenders willing to sacrifice quality for quantity. In our case, we prefer to team up with wholesale borrowers who think the same about risk as we do. Ultimately, it creates an added layer of protection in our transactions and results in an even more attractive risk-adjusted return.